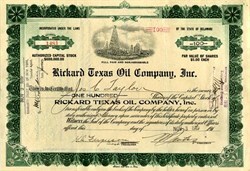 Beautiful engraved certificate from Rickard Texas Oil Company, Inc issued in 1920. This historic document was printed by the Security Banknote Company and has an ornate border around it with a vignette of a oil field. This item has the signatures of the Company’s Vice President and Secretary and is 95 years. EASTLAND COUNTY. Eastland County (E-15) is in Central Texas, bordered on the east by Erath County, on the north by Stephens and Palo Pinto counties, on the west by Callahan County, and on the south by Brown and Comanche counties. By 1881 the Texas and Pacific and the Texas Central railroads had reached the county. A new town was organized at the intersection of the two railways when residents of Red Gap, a mile away, moved and renamed their town Cisco. An intense rivalry grew between Eastland and Cisco, and in August 1881 a second county-seat election took place; Eastland won by 354 to 324. The railroads encouraged immigration and helped to open the area to commercial farming and trade. During the last twenty years of the nineteenth century the number of farms in Eastland County increased from 549 to 2,510, and numerous settlements were established, among them Ranger. In 1917, just as the cotton boom was disappearing, a major discovery of oil occurred in Ranger, on land leased from the Texas and Pacific Coal and Oil Company by William K. Gordon. The discovery touched off a spectacular oil boom that lasted into the 1920s. The county produced twenty-two million barrels in 1919, the peak year. Thousands of expectant workers and investors flocked into the county, among them George L. (Tex) Rickard with his Rickard Texas Oil Company, Inc, Jess Willard, the heavyweight champion, and novelist Rex Beach, who set his novel Flowing Gold in Ranger. For a time conditions were chaotic as new arrivals threw up shacks and tents faster than community services could handle them. Population figures reflected the boom: in 1910, 23,421 people lived in the county, but by 1920 the census reported 58,508 residents, placing Eastland County in tenth place among Texas counties. The oil boom also had the effect of encouraging railroads to build into the area. Earnings of the Texas and Pacific grew from $94,000 to $2,350,000 in 1918 and 1919. Circus man John Ringling built the Eastland, Wichita Falls and Gulf Railroad from Mangum to Breckwalker, while Ardmore, Oklahoma, promoter Jake L. Hamonqv extended his Wichita Falls, Ranger and Fort Worth to compete for the Ranger trade (see also RANGER, DESDEMONA, AND BRECKENRIDGE OILFIELDS). The boom faltered after oil production tapered off after 1922, but fortunately the agricultural sector began to recover at about that same time, driven in part by an increase in cattle production and a brief and limited resurgence of cotton production during the early 1920s. The number of cattle in the county almost doubled (from 11,085 to 20,174) between 1920 and 1930, and cotton production increased to 7,195 bales in 1926. By 1925 the number of farms and ranches in the county had increased to 2,012, more than 25 percent more than the number for 1910. By 1929, however, the figure had dropped to 1,990. County population figures for the time reflect the decline of the oil boom and declining number of farms. By 1930, only 34,156 people lived in Eastland County. Above History from the Handbook of Texas Online. RICKARD, GEORGE LEWIS (1871-1929). George Lewis (Tex) Rickard, professional boxing promoter, was born in Kansas City, Missouri, on January 2, 1871. When he was four years old his family moved to Sherman, Texas, where they purchased and operated a cattle ranch. The family later moved to Cambridge. Rickard spent his youth working cattle and, after the death of his father in 1881, supported his family in this way. At age twenty-three he was elected city marshall of Henrietta, the Clay county seat. In this position he established a reputation as a tolerant and honest lawman and a superior poker player, two qualities perhaps encouraged by the relative absence of serious crime in the community. While serving as marshal he met and married his first wife, Leona Bittick, to whom he was married until her death in 1925. Rickard, whose favorite pastime was gambling, moved to Alaska and established a number of gaming houses in the Klondike during the late 1890s. Though he was credited with operating the only "square" game in the Klondike, he accumulated $500,000 in four years; but he lost the fortune through the purchase of worthless gold claims. Following a short period spent as a gambler in California, Rickard moved to Goldfield, in a Nevada mining area, where he operated a gambling establishment. Rickard promoted a series of five heavyweight bouts-all featuring Dempsey, who became world champion with his victory over Willard-each of which exceeded $1,000,000 in receipts. These matches, staged from 1921 to 1927, included a rematch between Dempsey and Gene Tunney at Soldier Field in Chicago, Illinois, that drew over $2,600,000 in receipts. In 1925, Tex acquired the original Madison Square Garden, with the aid of circus owner John Ringling and others, and established the Madison Square Garden Corporation. This arrangement allowed investors to place their money in a corporation dedicated entirely to profitable sporting events. Rickard opened the new Madison Square Garden in December 1925 and acted as director of the facility until his death. In 1925, Tex promoted live events from Madison Square Garden in New York. It is interesting to note that a key business partner of Rickard's in this period was a concert and boxing promoter named Jess McMahon, who is the grandfather of current WWE promoter Vince McMahon. However, due to Rickard disliking the "sport" of professional wrestling, he did not co-promote wrestling events with McMahon, and it was not until 1935 that McMahon's son, Vincent J. McMahon, would begin promoting his Capitol Wrestling Corporation events. In spite of these objections to pro wrestling, Rickard and McMahon did promote boxing matches like the December 11, 1925 Light-Heavyweight championship match between Jack Delaney and Paul Berlenbach. In the 1920's, the best boxing promoters and managers were instrumental in bringing boxing to new audiences and provoking media and public interest. Arguably the most famous of all three-way partnership (fighter-manager-promoter) was that of Jack Dempsey (Heavyweight Champion, 1919-1926), his manager Jack Kearns, and Rickard as promoter. Together they grossed US$ 8.4 million in only five fights between 1921 and 1927 and ushered in a "golden age" of popularity for professional boxing in the 1920s. They were also responsible for the first live radio broadcast of a title-fight ( Dempsey v. Georges Carpentier, in 1921). Tex Rickard was awarded an NHL franchise in 1926 to compete with the now-long-forgotten New York Americans. The team was immediately dubbed "Tex's Rangers", and the nickname stuck as the New York Rangers. Rickard managed to get future legendary Toronto Maple Leafs coach Conn Smythe to assemble the team (including coach Lester Patrick), and it turned out to be a winner. In their first season, the New York Rangers finished atop the American Division, but would lose to the Boston Bruins in the playoffs. The Rangers won the Stanley Cup over the long-defunct Montreal Maroons in only their second year in business, but it was not without some desperation: coach Patrick had to be their goaltender for two periods of game two of the finals after regular goalie Lorne Chabot was injured. In 1926 he married his second wife, Maxine Hodges, at Lewisburg, West Virginia. The couple had one child. Believing that Florida was an area of potential growth and profit, Rickard began investing in the Miami Beach area during the 1920s. He constructed a dog-racing track there. He was engaged in fight promotion in Miami Beach when he died on January 6, 1929, of complications following an appendectomy. BIBLIOGRAPHY: Dictionary of American Biography. New York Times, January 7, 1929. Randy Roberts, Papa Jack: Jack Johnson and the Era of White Hopes (New York: Free Press, 1983). Randy Roberts, Jack Dempsey: The Manassa Mauler (Baton Rouge: Louisiana State University Press, 1979). Who Was Who in America, Vol. 4. IN A REAL SENSE there were two types of adventurers who rushed to the Klondike for gold. There were those who went to relieve the earth of its golden burden by picking up or picking out the gold everyone knew was there. These people were willing to endure hardship and hard work to get their gold. They were outdoor, honest, industrious people. The second group was mostly composed of people who rushed to the Klondike in an effort to relieve the relievers in the first group. These were the indoor, the crafty and the "never sweat" group determined to make their strike where it was warm and glasses clinked. "Tex" Rickard and his long-time Texas friend, Will Slack, were active members of the second group, having taken membership when they arrived in Alaska during November, 1895, about two years before the gold•mad hordes reached their peak. Up there too were Wyatt Earp, Lucky Baldwin, Calamity Jane, Jack London, Wilson Mizner, Key Pittman and even Marjorie Rambeau, the famed actress who was then a child performer. Tex and Will pushed on toward Juneau to await the spring thaw, and Tex immediately settled down for a long, long poker game. The street was lined with honky-tonks of all stripes and there was no shortage of gold dust. In April, Tex and Will set out for the Chilkoot Pass. burdened beyond belief with food, equipment, clothes and everything a prospector might need. It was so cold that the sun seemed to freeze in its endless celestial path. Tex later described the mounting of the Pass as the most difficult task he had ever accomplished. This from a hard-riding Texas cowboy! Slack eventually turned back to Juneau. But Tex pushed on, heading for Circle City, which already boasted 28 saloons, gambling halls and brothels, along with an opera house, two general stores and a blacksmith's shop. Circle City had something else too. When the thaw came, the place turned to a bog, festooned with moss so clinging it did everything but "jump up and wrestle with a man," as Mizner put it. Burning smudge pots darkened the sky 24 hours a day because the mosquitoes were monstrous and many. Miners had been known to die from repeated attacks and horses had to have their nostrils cleaned to keep them from strangling on the insects! But Tex didn't have any plans to be out in the moss, nor where the mosquitoes buzzed. Flatter than a salted snail, he immediately got a job as a dealer in a gambling layout owned by Sam Bonnifield, remembered as the Yukon's most famous gambler. Rickard did his best to emulate Sam, watching him win and lose thousands in what were considered routine games. One day Sam was handling the faro box and Louis Golden had $5,000 in dust riding on the queen. Sam turned the soda, the first card, a king. Then the second card was a queen, a winner for Golden. Sam looked up at Tex, then rose from the faro layout. "Tex, take over dealing. Pay Goldie that $5,000. Give him nineteen and a half pounds of gold dust! Aw, make it twenty pounds," Sam said laughing. But Goldie didn't want to quit. He took his money in $100 chips and before the night's play was over, he had lost $22,000! The next night, Sam ran into another sour streak and lost $75,000 plus the whole gambling house, saloon and trappings! He was just about to sign it over when a grub-staked prospector strode in and dumped two huge sacks of gold on the table. "That'll partly pay you for the stake," the miner said. Sam merely smiled as he shoved the gold over to the winner, then retrieved the papers of title. Before the next dawn, that lucky customer had been cleaned out of all the gold dust in those sacks, plus what he had on hand. Sam pushed another run hard and accumulated enough gold to buy the finest place in Circle City. "Here Tex," Sam said. "She's all yours." Tex was grateful, but his confidence exceeded his skill. In little more than a week, a steely-eyed gambler won the whole gambling layout. Tex shook hands with the new owner, wished him luck, then walked down the street to Sam's place where he was immediately hired as a bartender. Tex, chameleon-like, settled peaceably into the job as he had always done during most of his life before coming to the Yukon and Alaskan areas. DURING the 58 tumultuous years of his life which began January 2, 1871, in Clay County. Missouri, George Lewis Rickard seemed born to stand up and fight—or at least to get someone to fight for him as was proved with his million dollar gates in New York's boxing gardens. It was somehow typical, too, that even his first sounds were drowned out by others, as they were so often later. But the day he was born, bullets were flying about, and the roar of guns thundered outside as a hard-riding posse chased the James boys who lived thereabouts. Tex was only four when Pinkerton men raided the James' farmhouse, killing an 8-year-old boy and injuring three others. Tex's dad decided that was enough and they moved to Cambridge. Texas. Tex was shining shoes, cowboy hoots that is, by the time he was seven and he spent hours listening to the riders tell of their troubles on the trail, stampedes and gun fights. When Tex's father died, he quit school, at the third grade, and took over as man of the house. He got himself hired as a hand on a ranch near Henrietta for $10 a month. When he got some money ahead, his mother and numerous children moved nearby. For the next ten years, Tex grew up in a saddle, always looking to the far horizon, or even more frequently the sky. "One of these day I'll be able to reach up there, grab the stars and turn everyone of them into twenty dollar gold pieces," he would tell his mother with complete confidence. Tex was tough as whang leather and a hard, loyal worker. He worked up from wrangler to drag and a full fledged trail driver. Tex never provoked trouble but he never avoided it either. His model, and Tex always had one, was Sheriff Cooper Wright. a lawman with more guts than could be hung on a line fence. He watched Wright save killers from mobs and enforce the laws without fear or favor. Tex wanted to do the same. In time he did. During 1894 he was made city marshal of Henrietta and got married a few weeks later. Tex handled the miscreants with a glib tongue rather than a gun and his career was extremely successful. His home life wasn't. A year after being married his wife had a baby boy. He died shortly after birth and so did Leona, Tex's wife. Texas no longer held an allure for him and when news of the Alaskan gold strike came, he set off for the far horizon believing this was his chance to grab up those stars and turn 'em into gold. The main chance seemed to have arrived for Tex when news of the strike on the Klondike River came into Circle City. Immediately the prices of houses dropped from $500 to $25 and the price of dogs to pull sleds rose from $25 to $1500 each! Two days later Tex and Harry Ash hit the trail for the Klondike along with everyone else in Circle City. Tex staked out two claims along Bonanza Creek and hadn't raised much more than a frozen sweat when an Englishman gave him $60,000 for the claims. Tex's first impulse was to return to Texas and buy a ranch, but when Tom Turner convinced him that a gambling layout and saloon would be an indoor gold mine Tex forgot about Texas. They moved to the junction of the Klondike and Yukon Rivers where a tent city, Dawson, was already mushrooming. Tex and Turner opened the Northern saloon and within four months they had $155,000 in their pokes. One night later, Tex and Turner had been stripped of every cent, including the Northern. When he paid off and shook hands with the new owners, Tex didn't even have a place to sleep. For more than a year thereafter Tex worked as a dealer, bartender and handshaker, usually at the Monte Carlo, owned by Swiftwater Bill Gates. Though Tex drew $20 a shift, he was perpetually broke, not being able to convince himself that no one, not even a dealer, can successfully buck the house tiger. Tex carefully avoided the tin-horns and the short card artists, gambling honestly but not successfully. When the news of the enormous strike hit San Francisco on July 14, 1897, the northern gold rush was on! It was sheer, utter and complete tragedy for most of the adventurers. They died from hunger, from accident, from fights, from cold and privation. But the hardier ones kept moving northward. Dawson's 10,000 population doubled, then doubled again early in '98. One of those able to survive the chaos and danger was Wilson Mizner, one of the West's greatest wits, who worked alongside of Tex at the Monte Carlo. From that association they became life-long friends. It was a natural: Mizner was urbane and an endless talker. Tex was earthy and a patient listener. Curiously, too, it was Mizner who first opened Tex's eyes about the possibilities of promoting fights for a price. The first fight ended with one of the maulers being knocked through the ropes into Rickard's lap. Though Tex lost his bet, he was sold on the excitement and sport that would draw men anywhere in the world, but surely in the boom camps. Tex was a dedicated rainbow chaser already. Gold attracted Frank Slavin, called the Sydney Cornstalk. He wasn't much interested in fighting for a fee, but he got loaded in the Monte Carlo and was punched around by a Dawson bully-boy called Biff Hoffman. Mizner and Tex were on the spot to pull the men apart. Each convinced one man that such a contest should be staged where everyone could see it—for a price. They agreed. Seats were built in the dance hall and sold for $15 and $25 each. The seats were scarcely warm when the fight was over. Slavin knocked out Hoffman with his first punch. Rickard decided to take a geographic cure for his bad luck and moved towards Rampart, where the Yukon touches the Arctic Circle. Tex had the golden touch to promote his gambles. From Dawson on, he always worked with OPM Other People's Money. FLAMBOYANT even in the wilderness, Tex opened his layout with a "grand ball and a prize fight." It scored. So much in fact that there wasn't even room to build a ring. The circle of the miners pushed the men together until one was knocked out. Tex did very well while the Rampart boom ripped. But it wasn't more than dust deep. Tex, along with Rex Beach the novelist, and a few others spent a dismal winter cutting wood for the river steamers. But he got something even better than the $15 a cord for the wood. He got the news that a big strike had been made at Nome. Tex didn't have more than $50 to his name when he started -for Nome with Jim White, who pooled his $25 with Tex to start a tent gambling layout. Tex and Jim were among the first on the ground and they pitched on a Front Street lot which cost $100, but which they got for sugar-lip option. Planks for a board floor were acquired the same way. Then a shipload of whisky and other potables was left in Tex's care with the admonition to keep tab on what was used and pay when he could. A cigar salesman was talked out of his supplies and Tex and Jim were really in business. The first night they netted $1,000. Within 10 days, Jim sold out for $10,000. Tex dug deeper, knowing this was a good gamble. His reputation was well known in the North. Miners left their accumulated pokes with Tex, sometimes for weeks and months. Some were never claimed. In addition to being the best, most honest gambler in the area, Tex Rickard also became an informal hanker. Though thousands in gold dust lay in pokes behind the bar, his place was never robbed. Tex's honesty and luck parleyed when gold was discovered in the sands of the beach fronting Nome, literally a few feet from his Northern saloon. The bartenders, bums, dealers and dolls all rushed to pan out $100 a day. During the first two months, an estimated million dollars in gold was washed out with one claim producing nearly $50,000 in three days. Fabulous finds. The Northern sky seemed to lower just so Tex Rickard could pluck out the stars and turn them into gold coins. Tex wanted Goldfield to succeed and ' never lost a chance to ballyhoo the "great- ; est gold camp in the world." Once when there was a run on McCook's Goldfield Bank, the miners withdrew their cash and, not knowing quite what to do with it, left it with Tex at the Northern. To save the bank, Tex had his employes take the money out the back door and put it back in the bank. The run stopped in time and Tex had accomplishedit with typical Western methods.
' The shaping of Tex's later career began in Goldfield when newspapers across the nation began suggesting a world title between Joe Gans and Battling Nelson for the lightweight championship. From this start Tex was to become the premier promoter of the prize ring. Tex's motives weren't all noble, however. He realized that such a fight would draw thousands of sports who would want to drink and gamble. Besides, even the fight might make money. Battling Nelson and Joe Gans will engage in a finish fight in Goldfield on Labor Day. Billy Nolan, for the Dane. named the preliminary conditions.. . ." Reno residents tried to steal the fight away once Tex's efforts were published, but The Sun triumphantly reported: "Like a conquering hero or governor just before election day, Joe Gans sailed into Goldfield last night and was met at the station by prominent citizens who escorted the fighter downtown to remain for half hour the cynosure of hundreds of eager eyes . . . L. M. Sullivan met him at the train and took him in his auto ..." Tex, the kind of a tub thumper who could tell a lie twice and believe it himself, fed a constant stream of publicity into any media that would print it. Tex ran an honest game and a good saloon. Dealers and bartenders were summarily fired if caught cheating or abusing customers. But it wasn't always the housemen who cheated. Some of the miners would load their pokes with sand or mercury when they threw it over to the dealer for hefting and an exchange for chips. It wasn't done very often, however, because of Tex's great popularity among the men of the Far North. As he prospered, Tex continued to send money to his mother, who had now re-married and was living in Seattle. Tex staged fights as often as he could find contestants. Usually these matches were paid for by passing the hat among spectators. Most were bloody affairs. Tex made his money from the drinks and the gambling which followed such events. The crowds were the thing as far as he was concerned. Tex's interest in promotion might have been enhanced by the fact that both Sam Bonnifield and Louis Golden died paupers. But Tex was a gambler. He barred a scamp named Policy Bob who was a known cheat. When Bob got hooked on dope Tex heard of his plight and got medical help. "He's as good as dead," Tex was told. "Nothing can be done." Tex told them to give him whatever they could to ease his pain, or anything else. Bob began muttering restlessly in his terminal gasps. "Copper the deuce. Copper the deuce," Bob muttered. To Tex that was a sign from on high and he lit out to buck the faro tiger, with the play of coppering the deuce. (It simply means to bet a card to lose, rather than win.) Tex plunged. He lost. Lost. And continued to lose. He dropped more than $10,000. "Damn that crooked SOB," Tex muttered. "I knew he was a thief when he was alive, but I never thought he'd still be a crook when he was dying." Tex frittered away a lot of money in other gambling halls, because the gambler never quits. He was basically an honest man but in one Nome poker game, he couldn't resist the chance to use all the advantage presented him. Tex called a large opening bet more or less on a hunch. He noticed the other player was nervous and peeling his top card off, then sliding it to the bottom. Tex could spot the corner pip of each card. So he read the hand, then after calling made a raise. He was raised back and Tex raised again. The bets were called and the man stood pat. Tex Rickard drew cards to a pair of kings (!) then fired back a big raise. He made the opener lay his hand down, simply because he had read the hand and knew he had the man beat. "Keep your hands still and your fingers across the backs," Tex used to counsel his friends. "Gamblers take every edge, including me." AFTER seven years in the Northern deep freeze, Tex Rickard sold out for $50,000. All totalled he had only $65,000 despite the vast amount of money which had passed through his hands. Tex was restless and wanted to move around. The stars still beckoned on the far horizon. Tex wandered for a bit, then finally picked up with another man of the "never sweat" clan, Kid Highley, and they headed for southwestern Nevada late in 1904. Reports of a gold strike drew them like lemmings to the sea. Everyone said that the Goldfield strike was expected to be bigger and better than the one which had flared and smoldered on the Comstock Lode at Virginia City. BILLY NOLAN HAS A FEW WORDS TO ENCOURAGE FIGHT FANS. NOLAN SAYS NOTHING BUT AN ACT OF GOD CAN STOP FIGHT. CALENDAR OF EVENTS LEADING UP TO THE FIGHT. In time the arrival of the fighters, the signing of the contracts and the division of the purse (Nelson, $20.000; Gans, $10,'000), was all duly reported, along with detailed sketches of both fighters' lives. Even an enormously rich strike at the Mohawk, which was to make many men extremely wealthy, was only able to demand a two column head. Tex was getting Goldfield the publicity he wanted and the sports writers began to arrive to herald the attraction in even greater detail. Even the tricksy miners, busy with thefting jewelry ore from the mines, stepped up their stealing since they all wanted to get bets down one way or the other on the fight. There was some trouble over the selection of a referee, but George Siler was finally selected as agreeable to all concerned. Though a boom camp is always alive with activity, Goldfield was jumping as the Labor Day program drew near. The Sun said: "The streets of' Goldfield were literally jammed last night with a holiday crowd of persons from all walks of life. Trains rolled in at intervals all night, the last arriving at 5 A.M. . . . Drilling contests (a favorite in all boom camps) preceded the fight. Waters and Hill of Tonopah drilled 37 inches in 15 minutes. Burro and foot races followed...." The fight was all that even the most ardent fan or gambler would want; and it was one of the great days in the brief history of the great gold camp called Goldfield. For forty-two brawling, punishing rounds Gans and Nelson battled, the decision seeming to go neither way. But then came a sudden, sad climax. In the forty-second round Nelson fouled Gans and thereby forfeited the fight! Reporters noted that it was a palpable foul and that everyone saw it. There were no questions and no dispute as to the winner. which is perhaps just as well it ended that way. Joe Gans, the winner, sent a wire to his mother in Baltimore: MAMMY YOUR BOY IS BRINGING HOME THE BACON WITH LOTS OF GRAVY ON IT. Tex began to tote up the figures. Fans had paid in hard money about $70,000 for seats. He had netted $13.000 and had given the town of Goldfield a million dollars worth of free advertising. That afternoon the 200 Pullmans which had brought a portion of the throng began leaving. No one ever forgot that fight, especially the man who put it on—Tex Rickard. It was indeed, "The Battle of the Century." TEX'S success wasn't entirely crowned with continued good luck. The adopted daughter of his second wife was taken ill and died on the operating table. Tex refused to pay the bill because he claimed that the surgeon had erred in his skill and diagnosis. His wife was a semi-invalid from that point on. Shanghai Larry Sullivan, frustrated and antagonized with Tex's success, went gunning for the promoter on New Year's Day. Breaking ice for cooling beer at Tex Rickard's championship bout. THIS CHURCH IS CLOSED. GOD HAS GONE TO RAWHIDE. Tex fell into the checkered pattern and on the day of his arrival he purchased a prime lot for $8,000. (A few weeks before the entire area had been as empty as a moron's mind, and about as useful.) In 10 days Tex had a building 30 x 100 feet in which there was the usual supply of gambling layouts and innumerable bottles of the needful for the thirsty. 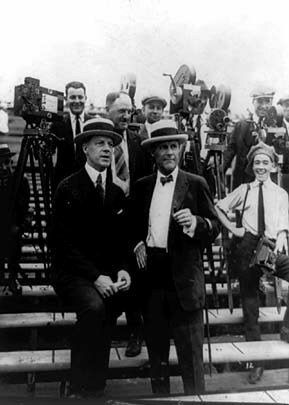 Tex and Highley, who was also associated in this venture, cleared $25,000 from gambling the opening night. The Northern's average profit was $1,000 a day for the next three months. A cow's tail was affixed to a post near Tex's saloon under a tin can. There was a small sign: "Drop Mail. Here for Rawhide" and residents of the booming town did so! Tex could see publicity and promotion in anything. When Riley Grannan died the funeral oration given by a de-frocked preacher was taken down verbatim by a court reporter, then printed and distributed. It has gone into a number of editions since then and is still selling. Elinor Glyn, authoress of "Three Weeks", was invited to visit Rawhide, and Tex even staged a fake fire and robbery for her. She was enchanted and, of course, the publicity was good for Tex and the Northern. But a real fire did the job, taking the Northern with it. Tex wandered off to Ely, Nevada, again acting as a front man. By this time the sporting world had about written off Tex's success with the Goldfield fight as sheer chance. One California newspaper even printed a derisive cartoon of Rickard showing him with donkey ears and the caption: WHERE'S BIG TALKING TEX RICKARD NOW? That was all it took to get Tex mad. Mad enough to raise a hundred thousand dollars to promote the Johnson-Jeffries fight which, after a great deal of backing and filling, was finally held before a record breaking crowd in Reno, July 4, 1910. It was promoted as the greatest fight in history, but it turned out to be something far less. It began slowly, monotonously and continued that way for the first 10 rounds. Johnson was a fast cat stalking his enemy and there was little question of the outcome when Johnson sliced Jeff's right eye with his left. Afew rounds later Jeffries made a desperate, futile attack but Johnson parried and moved away, the blows having little effect. It was the fifteenth round when the climax appeared certain. Johnson was a dancing master, in complete control of the fight, hitting Jeff at will. A flurry of short chops dropped the big white giant, Jeffries, who got up at nine. Johnson moved in and Jeffries dropped to the canvas again. Jeffries reeled and wobbled as he got up at nine. "Stop the fight! Stop it!" fans yelled. But it wasn't necessary. Jeffries was a helpless hulk now and Johnson dispatched him with as little pain as possible. A left, right and another left and Jeff sprawled over the lower rope, half out of the ring. The referee and Rickard raised Johnson's hand in victory, though Jeffries was neverofficially counted out. Even the hardest loser admitted that Jeff couldn't have gotten up by the count of 10 anyway. Tex's first big gate was $270,775 (which compared favorably with the five game World Series which drew $174,000). He had grabbed the first handful of stars and turned them into gold pieces. Rickard was now ready for the million dollar gates —ready to be the front man and always ready to shake hands at Madison Square Garden. Tex Rickard's career was at its neverto-be-forgotten peak when he promoted the fight between Jack Dempsey and Gorgeous George Carpentier at Jersey City. His second Dempsey-Tunney title fight at Chicago in 1927, drew an astounding two million six hundred thousand dollars. Tex had plucked his stars. He died not long afterwards.